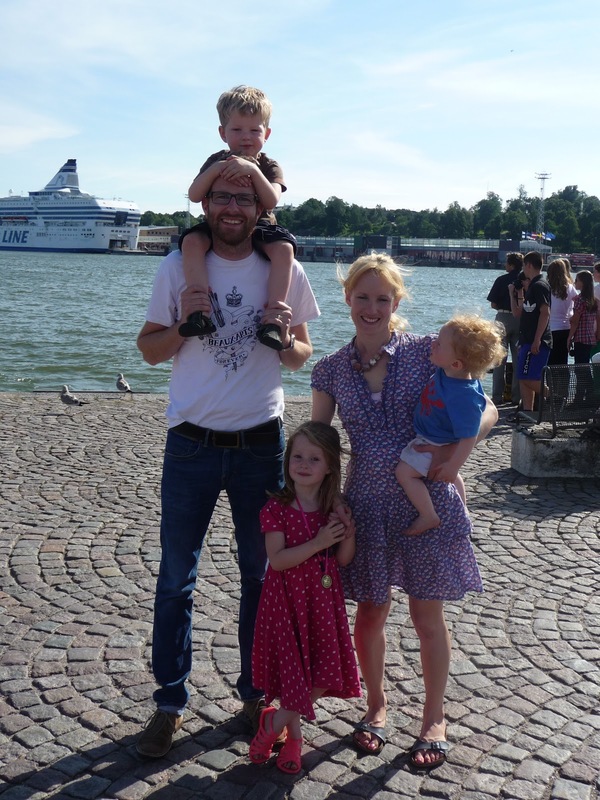 In the latest update, in this encouraging and inspiring series, we hear from Kevin Jones, who is preparing to move to Helsinki, Finland, with his family next year. I first met this wonderful family maybe three years ago whilst back in the UK one summer. Having ourselves moved to St Petersburg, it was here that God had spoken about the nearby Baltic capitals over the St Petersburg church plant - Helsinki and Tallinn were the two cities named. Clearly Hope Church's outworking of this has been quite different - with us now moved to Tallinn personally, and relationally encouraging these guys looking into Helsinki, as a near neighbour (and even nearer now we are personally in Tallinn!). So it was due to that word over Hope Church, as well on the back of the relationship Lydia Jones had with our friends Dave and Hannah (having been in the same church in Loughborough, UK) that I started meeting up with this family to help if I could and encourage their faith for what was ahead. It was great this summer to have Kevin come over to Tallinn for a day from Helsinki, where they spent the month of August getting a real feel for the place. Once planted, at just 50 miles north of Tallinn, Helsinki will be the nearest other Newfrontiers city church plant to us (once you get across the sea!). Tell us a little about the city you are moving to? Helsinki is the capital of Finland. The city itself has a population of around 600,000 but as populations increase, the areas to the North, east and west of the city are now merging together to form one much larger municipal area combining to form the worlds most northern urban area of over one million people. One in five Finns live in this area. Helsinki is strategically placed 80 kilometers (50 mi) north of Tallinn, Estonia, 400 kilometers (250 mi) east of Stockholm, Sweden, and 300 kilometers (190 mi) west of Saint Petersburg, Russia. Helsinki has close historical connections with these three cities. The architecture seems to reflect this with a mix of Scandinavian and Russian influence evident as you explore. Helsinki has a diverse and cosmopolitan atmosphere and is similar to most other European capital cities. The city is well organized, clean and safe to walk around and explore. In 2009, Helsinki was chosen to be the World Design Capital for 2012 by the International Council of Societies of Industrial Design, narrowly beating Eindhoven for the title. In the Economist Intelligence Unit's August 2012 Livability survey, assessing the best and worst cities to live in, Helsinki was placed 8th overall. Helsinki has a humid continental climate due to the influence of the Baltic Sea and Gulf Stream. Temperatures in winter are much higher than the far northern location might suggest, with the average in January and February around −5 °C. Temperatures below −20 °C occur normally a week or two in a year. Because of the latitude, days last less than six hours around the winter solstice but, Helsinki enjoys long days in summer [19 hours around the summer solstice]. Some people might look at church planting and feel they have no idea what to do - what would you say to help them? I feel that generally to a point it is ok to not know what to do. It is better to be humble and sensitive to the situation you are going in to in this sense than to be an expert who is very rigid on how to do church regardless of the cultural context. I think that one of the best things to do to help on this is to get relationally connected with those who are doing stuff you like and you relate to. Allow others to speak in to your life and open yourself up to learning from them. Go along to prayer days for nations/regions you are interested in to meet others and catch the heart of what God is doing in these situations. Visit others who are already doing what you would like to one day do. Perhaps depending on your circumstance [career, family etc.] offer to serve them in some way – give a year to living and working in a city where someone you can relate to is currently pioneering something. Keep regularly in touch with others doing similar stuff. Talk to your current church leaders about your dreams and ask what you can do now to help you develop according to your calling. Get stuck in now in your local setting and don’t look too far ahead that you don’t ever live in the now – bless the city you are in! How old were you when you planted your first church? I have never planted a church as the plant leader, but was in my late 20s when I was part of a leadership team which planted into Broadstairs in Kent. Helsinki is the next big step for us. One key thing I did learn at Broadstairs is that Church planting is perhaps more of a mindset than just the event of starting the church. I feel if you are a church planter you are always a church planter – you don’t just get the thing going, you see it as a process, you go on planting the church even after it’s been going for a while you are still planting it. That conviction continues whether you then plant again or whether you remain in the same context for 5/10 years or more – and feeds the DNA of the church to then become a planting and sending church. Thinking about a future move, what concerns do you have at this moment? Children adjusting. All of us moving away from friends and family in to what could be a more isolated situation. And what language are you doing your gatherings in? Language is an interesting topic at the moment. My heart is to gather in the native Finnish language for obvious reasons [not just wanting to attract ex-pats, not wanting to seem as if we a just a bunch of foreign missionaries moving in, wanting to demonstrate a strong commitment to serve the nation etc..] But practically Finnish is a very difficult language and we need to temper our desires to be authentic in the expression of our desires to be a church for Finland with the reality that to gather in Finnish alone would severely restrict the depth and fullness of communication and expression possible for us. It could be that some sort of mix [some Finnish some English] would initially be best – and also may serve the international nature of Helsinki as a city more effectively. In New Frontiers, we talk about building on an Apostolic and Prophetic foundation - how has that been seen through your situation? Prophetic words specific to us and ones in scripture about the increase of Christ's rule and the promises about God's people being a blessing to the nations etc. really got our attention in the beginning and have been a source of encouragement and direction throughout – We are so grateful though that as well as this we have the privilege of belonging to an apostolic movement of churches where it is so easy to draw relationally alongside others who can serve us. For us relationships [mainly through the Relational Mission sphere within Newfrontiers] have been a great source of confirmation as we have moved forwards on this journey. It has been wonderful to sense God calling us to Scandinavia and Finland – but also to discover that others involved in this region and offering to support us are such brilliant people who we really hit it off with, share a connection with and who’s hearts are so for us. It is great to experience the apostolic not as a structured, hierarchical thing but as a set of vital, dynamic relationships that we really want to be part of and benefit from. For us this a fundamental aspect which has served us so well in helping us step out in what God has been saying to us. It’s brilliant! Calling verses Gifting - where do you stand? To church plant into a different culture and go through all of the highs and lows that you may encounter, it is so important to know that you are called. There will come times when it will be difficult and discouraging. But when this happens our calling sets the perspective that these issues are God’s problem! I didn’t choose myself to do this he did – so he needs to sort something out and enable a breakthrough! Calling is so important. God is interested in gifting too – we see this through scripture, but it is important to make the distinction between gifting [i.e. the gift is from God] and self-sufficiency [i.e. I’m skilled enough to do it on my own]. My experience is that God delights in giving gifts to his church and it is often against the odds and against our natural disposition as individuals. In Ephesians we read about the risen Christ giving gifts to his church, so it’s good to have gifting and excel in the things God has given us but in the context of humility and acknowledgement of the giver. What I’m desperately fumbling around to try to say[!] is that God will equip us to do what he has called us to do. We should recognize a close relationship between calling and gifting. Paul says I can do all things through Christ who strengthens me, I think - not meaning I can do anything and everything, but Christ can strengthen me to do everything he is calling me into regardless of how skilled or proficient I feel about it. What is the role of internationals (ie non natives) in the life of a new church plant? For us this is important at the moment as we are still in the UK so many of the core group people we are working with are also currently with us in the UK, as are the majority of the apostolic relationships who are either based in the UK or originally from the UK . This is useful at the moment as we are around people we get and who get us. This is also important in our current situation as we will be moving into a church culture, which has not been particularly influenced by Newfrontiers. This means that the sorts of folk we will be looking to for support and guidance as we seek to bring New Testament church foundations to Helsinki will generally be non-Finnish UK or ex-UK based folk. This is not a preference to only work with those from the UK, but just the way it is at the moment. The native Finns we have been relating to have been so useful and have given us a greater insight and helped many new doors to open for us. We are so grateful for them and hope that these relationships will continue to flourish when we arrive in Finland. Can people still move to join you? Yes please! We are still very much at the gathering and team building stage so we’re open to building relationship with anyone who is sensing a similar call and wants to explore this further. How can someone pray for you and your church? • Pray for relationships as we interact with others who hear about us and try to consolidate the core group. • Pray for financial provision to help get us out to Helsinki in the first instance, that we might even have some support for a block of time to focus on language learning, getting settled in to the culture and life there and have time to focus on gathering the team. Also for jobs at the right time. • Pray that in the coming 10 months that things will continue to move forwards and that the momentum keeps going despite not being in Helsinki and having busy work demands etc. • Pray for Gods protection and blessing over us as a family [especially our three children], as we go through great change and transition. What one piece of advice would you give to someone feeling called to plant a church somewhere? Obviously seek God and build your life on him, submit to him and to the authority of your leaders. Don’t underestimate the importance of relationships in helping you step in to what God has prepared for you. This is so vital so take opportunities to communicate what is on your heart to others, doors may open as a result. God opens the doors for us, but it is also good to be intentional and proactive at putting ourselves in the right situations and contexts to help this happen. Thank you so much Kevin for this really helpful insight! 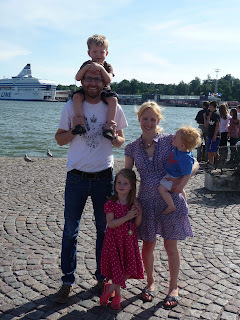 Kevin is part of the future Newfrontiers church plant into Helsinki, Finland.